Pepper has loved water since she was a little puppy having “pool parties” in her water bowl. 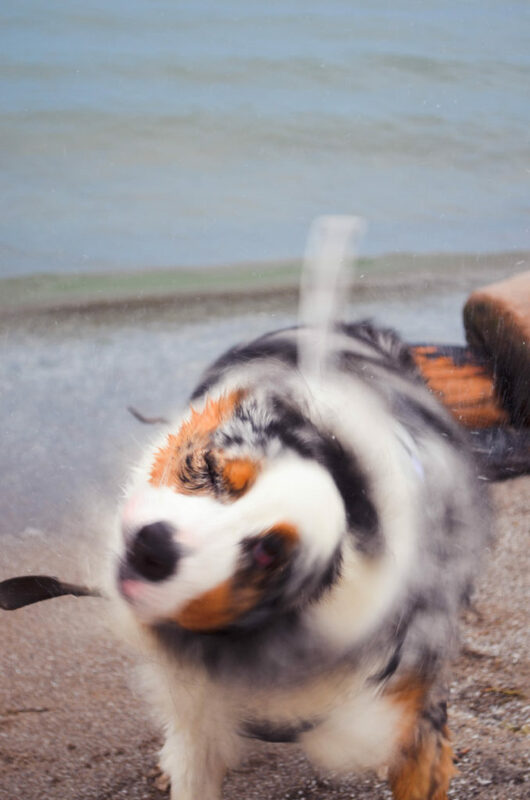 She loves chasing waves, splashing in puddles and running through sprinklers so we were very excited to take her up to the cottage and play in the lake. 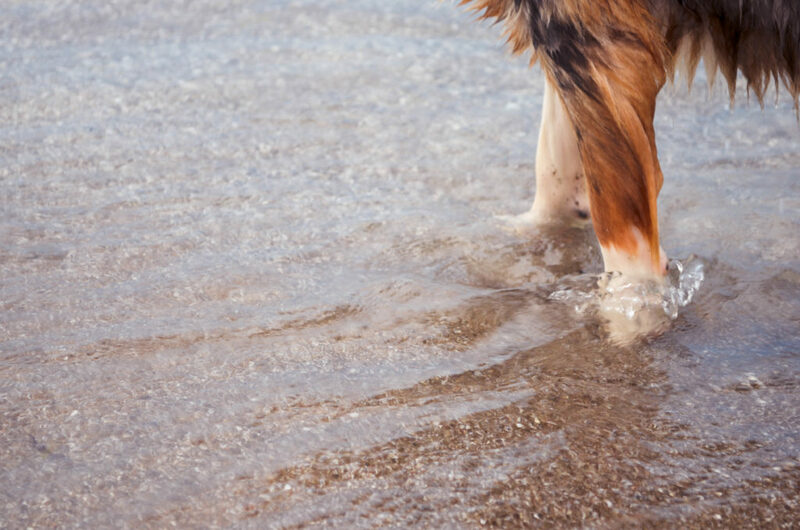 She liked putting her paws in the water and playing on the large rocks that stretch out into the lake, just under the water’s surface, but she only only properly swam once and didn’t seem to like the way her thick fur weighed her down. We decided to let her find swimming in her own time and accepted that, although she loves playing in shallow water, she may never like swimming. 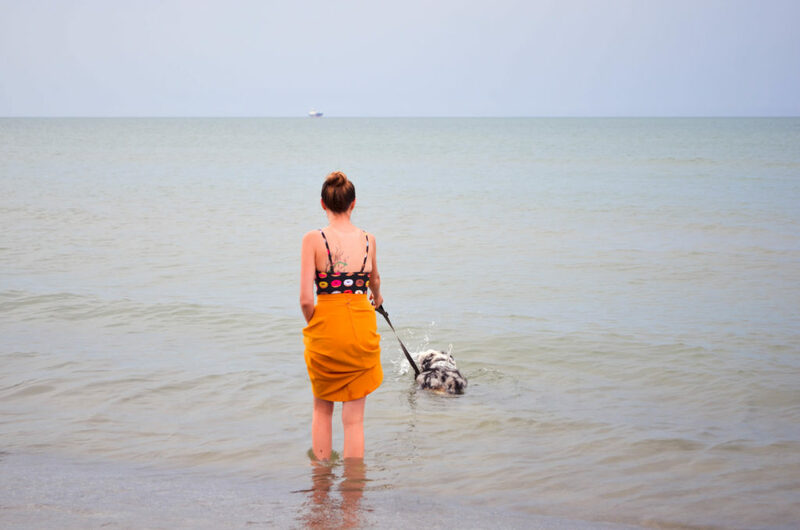 Since coming home from our weekend jaunt to the cottage, we’ve passed our steamy summer days walking along familiar rivers and taking evening trips to the beach. 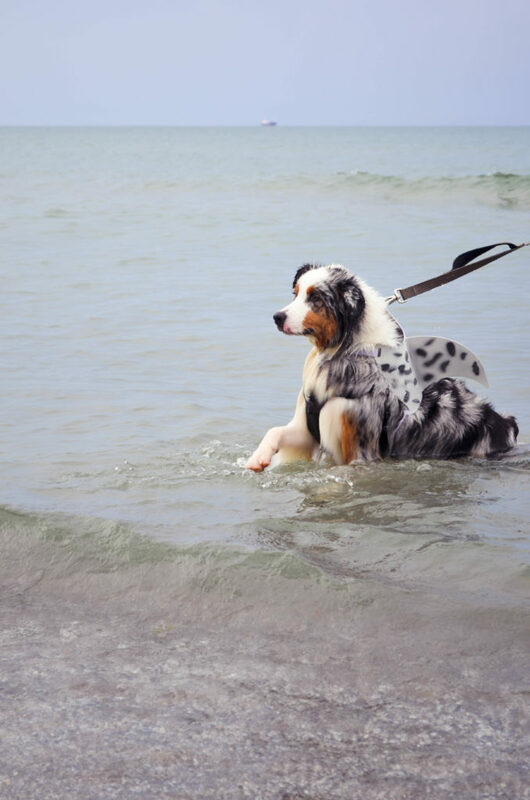 Pepper dips her legs in the river to cool down and enjoys running down the beach in the shallow water after a long, hot day. 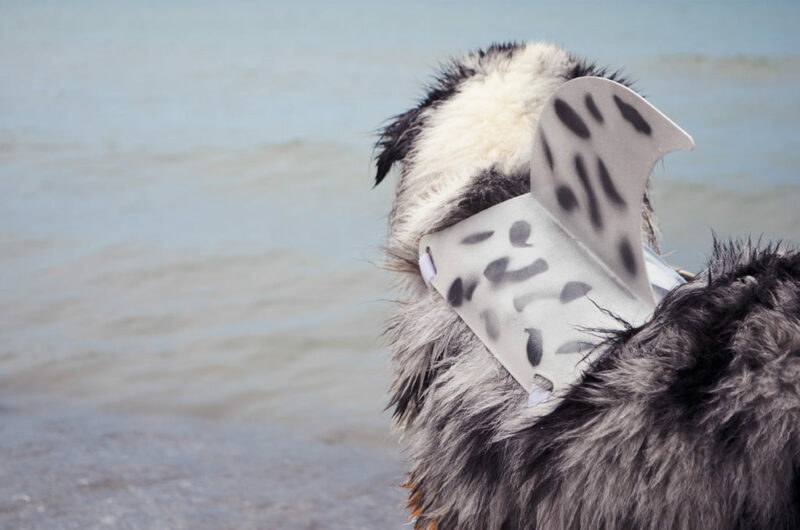 During one of our recent trips to the beach, she surprised us and confidently left the shallow shoreline to take a short swim with us as we waded out into the water; maybe her shark fin gave her courage. 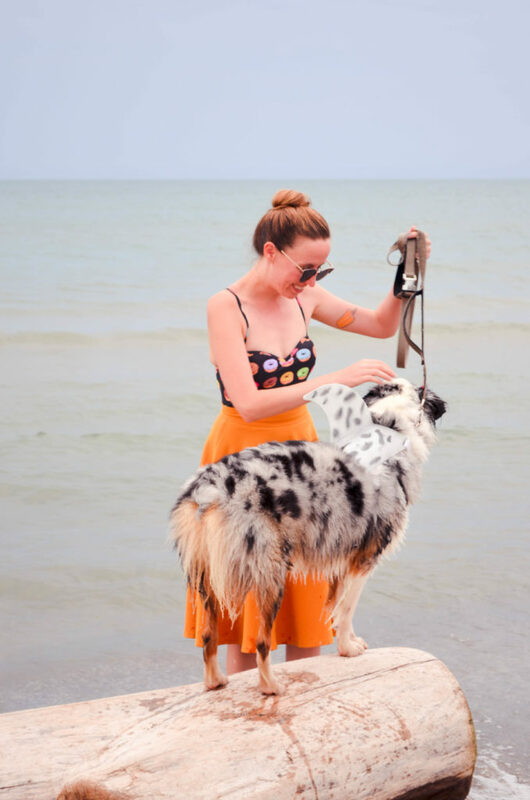 The next time we returned to the beach, she met another Australian Shepherd and paddled around with him for a little bit while his owner told us that he didn’t like swimming at first either. 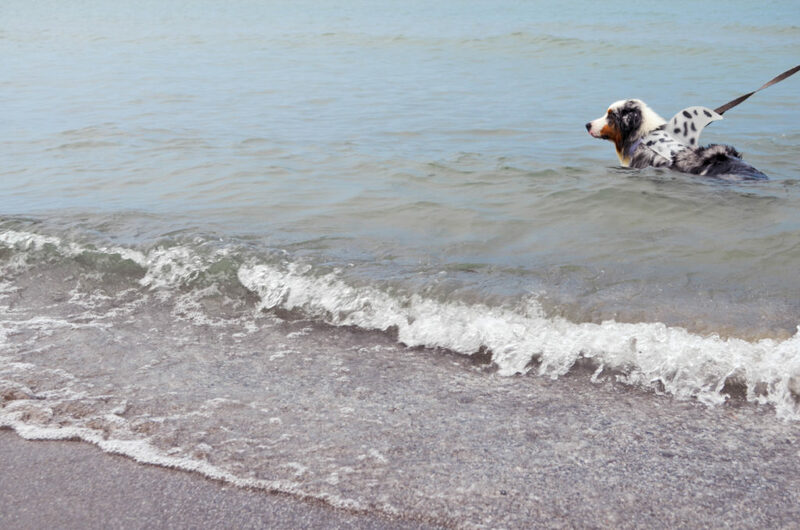 She dashed in and out of the water, swimming, herding the waves and shaking out the whole time we were there, like it was nothing. The lake at the cottage is a little different because there isn’t really anywhere you can ease in, you just have to jump, so I’m not sure she’ll get in this time either, but I’m so excited to see if she’ll swim while we’re up there again for our summer vacation. All photos by me and Matt Harrison. 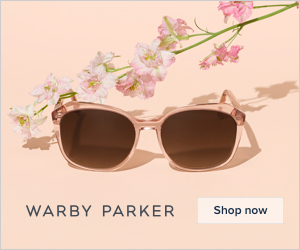 This entry was posted in Personal Style and tagged Summer, Beach, Bathing Suit, Shark Week. Bookmark the permalink.